Paul Reed is a leading military historian and author, who works in television. Paul has lived on the Somme battlefields since the mid-1990s, and has been visiting the area since 1982. He has written several books on the battle including the best-selling Walking The Somme. For many years Paul has worked in television, on a string of TV history programmes including Meet The Ancestors, Timewatch, My Family At War, Who Do You Think You Are, and more recently worked on Channel 5’s WW1 Tunnels of Death. 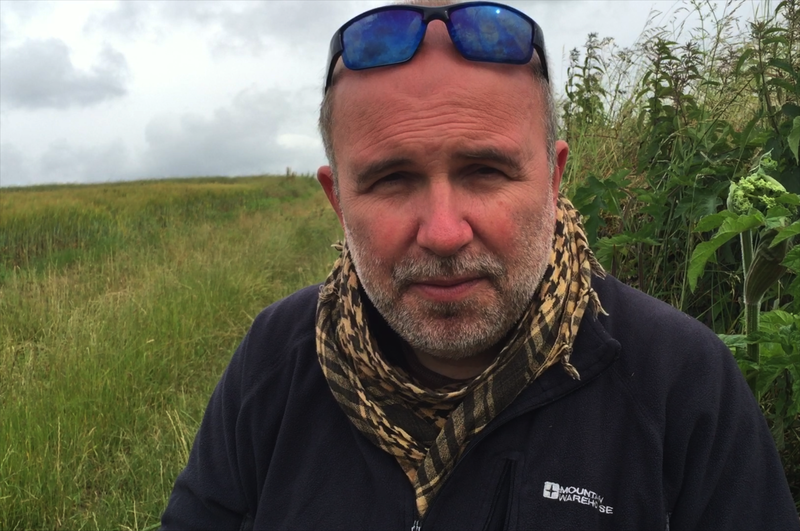 In 2016 he was an advisor to the BBC for Somme100 coverage and is currently working on a documentary about the Somme for Channel 4 which will be shown in November 2016. Full details of his Television work and publications can be seen by clicking the tabs above. Paul also works as Head Battlefield Guide for Leger Holidays and this site and his well-received Great War Photos and WW1 Centenary websites are his on-line contribution to the Centenary of the Great War which started in 2014. I would recommend walks around Beaumont Hamel and the Poets Walk as two good ones to start with to get a feel of the start of the Somme and a walk round High Wood for the later operations. Hope you have a memorable trip. Mr. Reed, would you please contact me about a possible series of tours? I’d like to detail our interest. Thanks in advance. hello Paul, I’m wondering about the Somme Centenary. Do you think it’s premature to start booking for 1 July 2016? I’ve already heard some accommodation in the region has been booked solid. Might be worth enquiring asap. Dear Paul. I wonder whether you can help me. I am researching my Great Uncle Edward Vincent Johnson who died of wounds on 12th July 1916 aged 24 years. He is buried at Doullens Communal Cemetery Extension No. 1, where his grave is one of only two men buried there who served with the 1st/5th Bn The London Regiment (The London Rifle Brigade). I am trying to find out where and when he was wounded, as I find it very strange that he should be buried in a ‘out of the way’ place when others who served in the diversionary attack on Gommecourt and were killed on 1st July are either buried at Gommecourt British Cemetery or others close by or if they were wounded they were shipped back to England within 3 or 4 days. I would like to find out if he was wounded on 1st July and then succumbed to his wounds, maybe infection, 12 days later, or whether he was wounded and died on the same day, but I do not know whether his Battalion was involved in any conflict on that day as the War Diaries indicate that they were bedded in at Fonquevillers doing improvement work in the trenches. Is there anyway I can find out the name of the wounded on a daily basis? In Alan MacDonald’s book ‘Pro Patria Mori’ he is listed under his Battalion but states that his Company and Platoon is unknown. How can I find out which Company and Platoon he was with? I know that I am fortunate to have a grave for my Great Uncle (I have visited the grave) but I feel so sorry for him that he was alone at the end and not buried with his mates. I would love to understand more about his circumstances. Hi Carol: he is buried there as he must have died in a Casualty Clearing Station at Doullens. When that happened soldiers were buried in a nearby cemetery not back on the battlefields. It is possible he was a 1st July casualty who died on the 12th but in that time I would have expected him to be in a medical facility further back. So he may have survived 1st July and been wounded some days later and then died at Doullens. Normally men who died there had been wounded 3/4 days before. The only exception would be a wound where they could not move him. No lists of wounded survive and there is no way to ascertain his platoon or company. Sadly so many records have been destroyed. Hope that helps? Paul, we are a team of academic researchers (international but based in the UK) working on a very specific project and wish to gain access to the underground, particularly where the American photographer Jeff Gusky has been. We wish to study the carvings and graffiti of faces and heads in particular. Is it possible to get a private email contact for you? I would like to speak to Paul Reed about my father Reginald St John Battersby who was commissioned aged 15 years and 2 months into the 11th East Lancs. I believe he was the youngest commissioned officer in WWI but am not sure. My name is Tara. I work for Good Morning Britain on ITV. Anthony I have been reading the incredible story of your father. I wondered whether I could speak to you further about this for some filming work I’m doing for the centenary. Paul I wondered whether I could contact you too for the work you do. Hello Paul. I wonder if you can help me. My grandfather, George Suckling, enlisted with the Middlesex 17th Battalion on 24th August 1915, aged 17. At some point he transferred to the Devonshire regiment, but I’ve been unable to find out when that happened so don’t know where he would have fought. I know he ended up being demobbed from Salonika in 1919, but would really love to find out if he was at The Somme. I’ve tried the National Archives and British Forces websites but to no avail. All I can find is his medal sheet and demob letter/certificate. If you could point me in the right direction I’d be most grateful.